Please contact us at ssbarrels@fuse.net if you would like a freight quote. The quote calculated for USPS or UPS will not be correct for this order! Condition: USED LIKE NEW Franke BLEFA (German-made)! Highest quality kegs on the market with a 30 year guarantee by BLEFA; kegs in this listing vary from year produced from 2011 to 2016. Kegs were surplus from a large micro-brewery and are 100% legally owned. 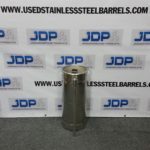 304 Stainless Steel with the circlip keg neck( without threads); valve type is Sankey D. Paid extra to have these kegs professionally de-branded (knurled), de-stickered and polished down the sides of the kegs by BLEFA. The kegs pictured are representative of the kegs you may receive. Since these kegs had a previous life, you will find dents, dings, scuffs, scratches and other blemishes; all previous life items are just cosmetic. The keg/s you will receive are fully functioning. Kegs have not been cleaned from previous use and will require a good cleaning and sanitizing prior to reuse. Keg Uses: Great for brewing beer, fermenting wine, boiling, storage, etc. Use this keg to create just about anything! Keg furniture or even a keg Smoker! *Please take caution when removing the spear as pressure has been built up and should slowly be released prior to removing the stem valve.